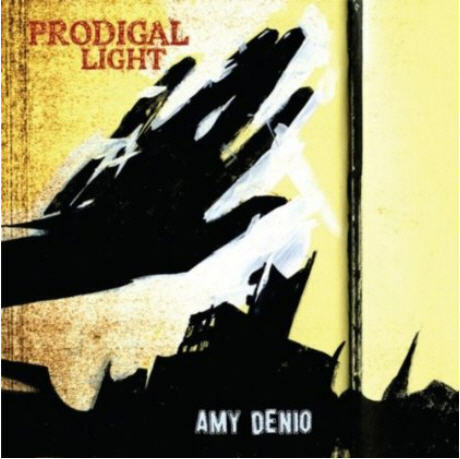 Listening to Prodigal Light is like opening up a box and finding a whole miniature city inside, with buildings, parks, people, animals, and so on, all existing with no apparent awareness that they're living in a box. We can focus in on various scenes, and they come equipped with musical soundtracks featuring small virtual ensembles of musicians — I say virtual because they mostly consist of Amy Denio herself doing multiple parts, vocal, guitar, bass, saxes, clarinet, accordion, and so on; 24 collaborators (one of which is a dog) contribute a wide variety of instrumental and vocal sounds as well, but this is clearly Denio's work. As our attention wanders around this diminutive world, we see various scenes play out: at a cemetary outside an old abbey, a lone figure gazes down at a grave and bids farewell to an old friend no longer living whose "soul was saved by music" and remembers the beautiful songs sung; monks of an obscure religion chant incomprehensibly while a woman mumbles about transcendence; in a dark room, a mother tells her child a rambling bedtime story about the moon seeing its reflection in the window glass and wondering how it works, and the strange inhabitants of the moon's dark side, its derriere; in a candle-lit caffe, aging Italian revolutionaries sing "Sventola la Bandiera Rossa" ("Raise the Red Flag"); in some rooms, we find scenes seemingly come to life from surrealist paintings, with unrelated objects jumbled together, moving in and out of focus, tumbling at the whim of unseen winds or spontaneously catching fire or morphing into different shapes. This soundtrack to a dollhouse world is fascinating, perplexing, and imbued with fractal detail, revealing deeper layers of convolution each time you zoom closer.